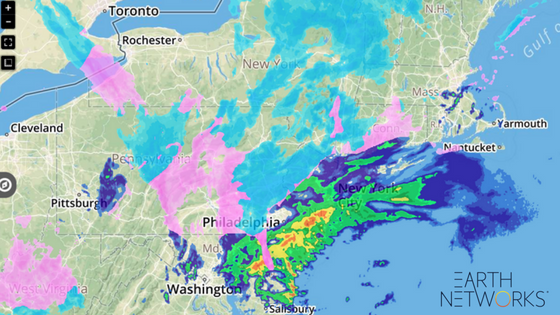 A brand-new winter Nor’easter is collecting all its ingredients today. 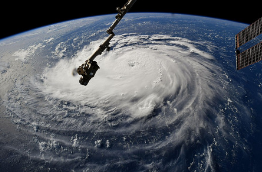 As we write this piece, it’s gaining strength and churning up the eastern coastline. Several key ingredients are coming together this morning to produce the second coastal storm in less than a week on the East Coast. A new center of low pressure developed off the southern Mid-Atlantic. This system, using upper-level energy from the system that brought snow to the Midwest earlier this week, will strengthen as it approaches Long Island this afternoon and evening. The strong low pressure will continue to push northeast into eastern New England overnight tonight and early Thursday before slowly weakening as it pushes into northern Maine Friday. As the storm pushes north, a rain and snow mix will develop right along the I-95 corridor from Philadelphia to Boston this morning with snow pushing into the Poconos, northwestern New Jersey, central New York and New England as the afternoon unfolds. The major Interstate 95 cities will change to all snow late this afternoon, with several inches likely, mainly north and northeast of Baltimore. 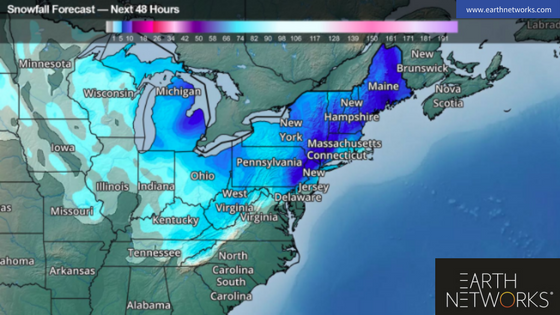 More than a foot of snow could fall across the Lehigh Valley, Poconos, northwestern New Jersey, and central Hudson Valley, with 12 to 18 inches likely across parts of northern New Jersey, New York’s Catskills and a few spots of the upper Connecticut Valley and Massachusetts Berkshires seeing up to 2 feet of snow. With all of this snow, it’s important for businesses and residents alike to brush up on their winter weather safety tips. Snow is already falling across eastern Pennsylvania, northern New Jersey, eastern New York and western New England, Winter Storm Warnings have been issued from eastern Pennsylvania to Maine, including Philadelphia, Trenton, N.J., New York, Long Island and Albany, N.Y., Burlington, Vt., Hartford, Conn., Providence, R.I., Concord and Manchester, N.H., Boston and Portland and Augusta, Maine. A Winter Weather Advisory has also been issued across the northern Blue Ridge Mountains in Maryland, Virginia, and West Virginia, where freezing rain and sleet will continue to cause travel headaches today. Besides the heavy snow, this winter Nor’easter will bring a storm surge up to 2 feet for Long Island and northern New Jersey today and Thursday. Boston Harbor could see 1 to 3 feet storm surge renew the coastal flooding threat for this area of New England. Coastal Flood Warnings have been issued for several coastal locations of Massachusetts and Long Island. Wind gusts will be strongest from Long Island to southeastern New England. Here, gusts will likely reach 30 to 45 mph. A combination of a saturated ground and a brisk wind will likely knock out power to at least a few spots where the lights just recently came back on from last week’s storm. 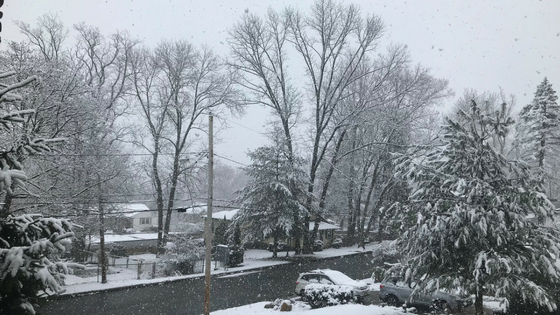 Stay with Earth Networks for the latest on the developing winter Nor’easter and updates regarding snow potential for the Northeast. 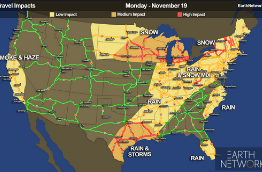 If you’re a Sferic Maps customer, log in and go to the Severe Weather layers section to look at snowfall amount, snowfall probability, and freezing rain forecasts in real time. 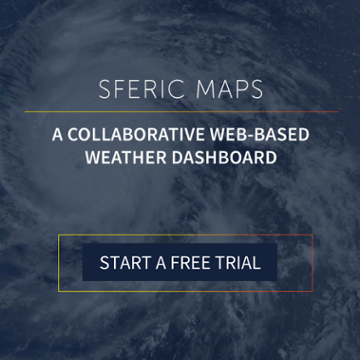 If you’re not a Sferic Maps customer, you can try a trial for free today to track the storm by clicking on the image below. Real-time weather information helps businesses make the right call during severe weather events, like this snowstorm. 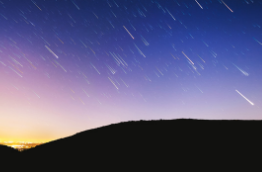 Will a user encounter a jitter/wobbling problem with Iphones built-in OIS, the one that Osmo Mobile users do? And can I use this gimbal during rain or snowfall (actual for Russia)? Thank you. Hi, we’ve never experienced a jitter/wobbling problem. If you have a specific problem with Sferic Maps, please email our customer care team at CustomerCare@earthnetworks.com. Thank you.